This article is about Sonic's appearance in Super Smash Bros. Ultimate. For the character in other contexts, see Sonic the Hedgehog. Sonic (ソニック, Sonic) is a playable character in Super Smash Bros. Ultimate. He was confirmed as a playable character on June 12th, 2018. Sonic is classified as fighter #38. As in Smash 4, Roger Craig Smith's portrayal of Sonic from various Sonic games and Jun'ichi Kanemaru’s portrayal of Sonic from Brawl was repurposed for the English and Japanese versions of Ultimate respectively. Alexandre Gillet, Jonathan López, Marc Stachel and Renato Novara's portrayals of Sonic from various Sonic games used in Smash 4 were also repurposed for the French, Spanish, German, and Italian versions respectively. Play VS. matches, with Sonic being the 17th character to be unlocked. Clear Classic Mode with Mario or anyone in his unlock tree, being the first character unlocked. With the exception of the third method, Sonic must then be defeated on Green Hill Zone. Sonic is a lightweight who, staying true to his home series, has very fast mobility. He possesses the fastest dash speed in the game, the seventh-fastest walk speed, the 12th fastest air speed (tied with Mario, Donkey Kong, Little Mac and Inkling), and the highest traction. Combined with his above-average falling speed, Sonic can move across the stage at blinding speeds despite his slow air acceleration. In addition, he can also wall jump. Sonic's special moves are quite useful. Spin Dash and Spin Charge allow him to not only move across stages at varying speed, but also do damage on contact. He can jump while charging Spin Dash. Spin Charge on the other hand hits multiple times and moves faster, making it a good alternative for dashing. Both give Sonic additional protection when recovering and combo into other moves. The mobility of both in tandem with Sonic's already impressive speed make him capable of quickly adding on damage to unprepared opponents from anywhere on the stage, and they can clank and cancel out the effects of certain projectiles, such as Snake's C4. Homing Attack deals a varying amount of damage, homes in on the nearest opponent and is good for punishing laggy moves and edge-guard breaking. Its uncharged state also has potential to combo and its charged state has K.O. potential at higher percents. Spring Jump is a useful recovery that grants intangibility at the start, goes very high, and is one of few recovery moves that do not cause a helpless state, enabling Sonic to attack and dodge during his descent and even extend his recovery with a directional air dodge. The spring that is dropped can be useful both on-stage and off-stage by allowing him to pressure and gimp opponents, respectively. Sonic also has a powerful air game. Neutral aerial is a great combo starter when SHFF'd, as a result of its long-lasting hitbox, low landing lag, and launching angle. Forward aerial is useful for edge-guarding and, in certain instances, can combo into itself on-stage at low percentages, thanks to its auto-canceling window and Sonic's fast air speed. Up aerial possesses KO potential near the upper blast line and is great for combos, while its auto-canceling window makes it deceptively safe. Back aerial's clean hitbox is powerful, making it one of his few reliable KOing options like his up aerial, and coupled with its strength within Sonic's kit, also makes it his best aerial finisher. Lastly, down aerial is a stall-then-fall; although it is Sonic's least effective aerial, it has noticeably less ending lag compared to other stall-then-falls, and its initial hitbox meteor smashes aerial opponents. Sonic's neutral attack, tilts, and throws have decent damage outputs and good speed, making them hard to punish. His grab game is decent overall: While none of Sonic's grabs excel in speed and each of them have average ranges, they are still fairly easy to land thanks to his outstanding speed. Sonic's pummel is also quick and has an average damage output, allowing him to rack up a fair amount of damage before throwing an opponent. Down throw is a semi-spike that has high base knockback, whichs make it excellent for setting up edge-guards and tech-chases. Back throw also has high base knockback and KOs much earlier than his other throws, especially if it is used while near the edge. It also moves Sonic backward, which makes it useful for setting up an immediate edge-guard attempt. Up throw is a reliable combo starter, having decently damaging combos beginning at 0%, as well as Spring Jump-assisted aerial combos beginning at medium percentages. It also has KO potential, although it only KOs reliably at very high percentages when used on high platforms, such as Battlefield's top platform, as well as stages with low upper blast zones. Lastly, forward throw is his least useful throw, as its primary utility is for forcing the opponent away from him. Like up throw, it can also function as a KOing option, albeit only when used on the edge at very high percentages. Mastering Sonic's running game is crucial to Sonic's ability to perform at higher levels, and is one of the factors that makes him so difficult to play competitively. Sonic users take advantage of a variety of dash or dash-related techniques that are seldom used by other characters. Dash-dancing is much less useful in Ultimate than it was in Melee, but it can be extremely useful for mind games in Sonic's gameplay, such as by running in one direction and then quickly turning the other way around to bait an opponent or catch them off-guard. It is often regarded by Sonic players that it is better to run away from the opponent and run back than to use roll-dodges to avoid opponents. This allows the player to avoid damage, not be as easily punished, have more control over their actions, and be able to punish their opponent's attacks. Dash-dance pivots (consisting of fox-trotting away from the opponent, then quickly dash-dancing backwards) are particularly effective for this, as they can cause almost immediate turnarounds and then grabs can then be used to punish opponents. Sonic has some weaknesses, the most noticeable of which is his KO potential. His KO potential is held back by his most reliable KOing options (forward/up smashes, clean back aerial, and up aerial) requiring good positioning and, aside from up aerial, having noticeable start-up and ending lag. His forward and up smashes are also burdened with low base knockback, which forces them to be used for KO attempts later instead of earlier. Despite his outstanding mobility, Sonic may struggle to land due to his very slow air acceleration, leaving him susceptible to juggling. Sonic can also have difficulty dealing with camping, since any ground-level projectile can severely limit his movement options. While Homing Attack and Spin Dash are his best options in getting through said projectiles, they can be reacted to and even predicted. Some of his attacks are also very punishable should they miss, and thus allow openings for opponents to punish him. His recovery is also predictable with Spring Jump as his only vertical recovery option, as its linearity makes him susceptible to gimps even at relatively low percentages. Finally, Sonic can be susceptible to early KOs due to his light weight. Sonic's matchups are difficult to define, as they vary greatly from player to player, possibly moreso than for any other character. Sonic players to this day find it difficult to agree on which matchups are Sonic's worst. Depending on the play-style of the Sonic, he can have a decent matchup against almost any character in the game, even at competitive levels. Because of his prowess for mindgaming and switching up tactics, as well as the inherent strengths and weaknesses to each style of play, some Sonic mains argue that Sonic has no truly disadvantageous matchups as a character, and that his matchups are much more heavily influenced by playstyle than his actual attributes. In all, Sonic has a great offensive play, has a strong neutral game and can very rapidly damage his opponents, but can have some trouble KOing. Sonic has received a mix of buffs and nerfs, but was generally nerfed overall. His biggest nerf was to his Spin Dash, which is no longer able to be shield canceled and no longer goes through shield unless being fully charged, making it less safe of a move. His up aerial also doesn't connect as reliably and Spring Jump provides less intangibility, making him easier to edgeguard him. However, he received some useful buffs, such as his down tilt and up throw having more combo potential and his aerials having significantly less landing lag, improving his combo game when combined with the universal jump squat reduction and faster jump speed. His Homing Attack has also been greatly buffed, as it comes out much faster when the button is pressed, does more damage and knockback when fully charged and locks on opponents better and can even potentially combo if uncharged, as well as gaining KO potential at high percents if fully charged. While Sonic still retains his powerful attributes and combo game, he now relies on offensive play rather than defensive, and cannot depend as heavily on Spin Dash to approach opponents as he did before. Nevertheless, he's seen some success in Ultimate's early metagame, with KEN winning Midwest Mayhem Ultimate and placing well in Japan while solely using Sonic and 6WX doing good in locals. As with all veterans returning from Smash 4, Sonic's model features a more subdued color scheme. His fur is now lightly detailed similar to other furry characters. Like most of the cast, Sonic is more expressive, as he now grins while dashing and now has an angry expression when using some of his attacks. Sonic's head quills bounce and move around more, resembling how their movement was in Brawl. Sonic now grins during his running victory pose instead of smirking, like in Brawl. Sonic's Chaos Emerald victory animation now has him running up to the Emerald before grabbing it. Like all characters, Sonic's jumpsquat animation now takes three frames to complete (down from 5). Sonic walks faster (1.375 → 1.444). Sonic runs faster (3.5 → 3.85). Sonic's initial dash is significantly faster (1.5 → 2.31). Sonic's traction has been massively increased (0.06 → 0.138), and is now the best in the entire game. This makes it much easier for him to punish out of shield. Sonic's air speed is faster (1.15 → 1.208). Sonic's fast-fall is faster (2.32 → 2.64). This improves his air mobility and makes him less susceptible to juggles. Sonic is considerably lighter (94 → 86) and now only weighs slightly more than Zelda, making his survivability much worse but also makes him less prone to combos. Forward roll has slightly more ending lag (frame 28 → 29). Back roll has more ending lag (frame 28 → 34). Spot dodge's intangibility has been altered (frames 2-15 → 3-16). Spot dodge has slightly more ending lag (frame 24 → 25). Air dodge grants slightly more intangibility (frames 2-25 → 2-26). Air dodge has significantly more ending lag (frame 30 → 51). Sonic now takes a slight amount of damage per second when swimming. He shares this with Charizard, Inkling, and Incineroar. His swimming animation is also changed, as he is now constantly in a panicked state (as opposed to only being in one when drowning). Neutral attack's second hit can lock. It does slightly less damage (2% → 1.5%). Neutral attack's third hit has a slightly different animation. Both hits of up tilt have less startup lag (frame 7 → 6 (hit 1), frame 18 → 13 (hit 2)). Since the move has the same duration, it effectively has more ending lag, reducing its combo potential. Down tilt launches at a more upward angle, improving its combo potential. Down tilt sends Sonic forward and then back to where he started. This makes the move slightly more safe in terms of positioning. This means down tilt can no longer make him pseudo-crawl. Sonic's previous dash attack has its Spin Attack portion removed, with only the lunge kick being intact. Due to this change, his dash attack is no longer a multi-hit. Dash attack has much less ending lag (FAF 62 → 50). Forward smash has significantly more range. Up smash has slightly less startup lag (frame 19 → 18). Down smash's front hit deals much more knockback, being as strong as the back hit. All aerials have less landing lag (Neutral: 16 frames → 10, Forward: 26 → 16, Back: 30 → 15, Up: 21 → 13, Down: 38 → 21). Forward aerial connects more reliably, making it better for dragging opponents off stage. Up aerial's hits connect less reliably. Up aerial's second hit deals more damage (6% → 8%) with knockback compensated. Down aerial's meteor smash hit has less startup lag (frame 19 → 17). All grabs have more ending lag (frame 31 → 38 (standing), 38 → 48 (dash), 37 → 40 (pivot)). Standing and pivot grab have slightly more startup lag (frame 6 → 7 (standing), frame 10 → 11 (pivot)). Pummel has a slightly different animation. It deals less damage (2% → 1.3%). Forward throw sends opponents at a more horizontal angle that is more desirable for edgeguarding. Back throw deals slightly less knockback. Up throw has increased combo ability due to Sonic's faster jumpsquat and jump speed. Down throw's last hit deals slightly more damage (4% → 5%). Sonic hops a bit higher after performing his down throw, giving it more ending lag. Front floor attack deals slightly more damage (6% → 7%). Homing Attack shows a reticle on the opponent right before Sonic is about to strike, as in games from Sonic and the Secret Rings onward. The reticle most closely resembles its design in Sonic Colors. Homing Attack can be charged for much longer, with Sonic ascending much higher during the charge. Homing Attack deals more damage (5%-12% → 7%-20%) and more knockback when fully charged. Homing Attack has improved accuracy. Homing Attack has less startup lag when the attack button is pressed (frame 22 → 15). It has combo potential in this uncharged state. Sonic no longer loses his double jump after landing with an aerial Spin Dash or Spin Charge. A grounded charged Spin Dash can be released in the air while keeping its charge. Spin Dash's charge can no longer be canceled by pressing shield. It can only be canceled by double jumping after unleashing it. An uncharged Spin Dash stops upon hitting an opponent's shield, reducing its safety. Sonic gains slightly more vertical height from Spring Jump. The Directional Air-Dodge allows Sonic to gain slightly extra vertical height after using Spring Jump when directed upwards, aiding him in his recovery. Aerial Spring Jump's Spring deals less knockback, making it harder to chain and KO opponents. Spring Jump provides significantly less intangibility to Sonic (frames 5-13 → 5-7). Spin Charge changes the color of the trail to indicate charge strength, going from blue, to cyan, to yellow. Its hits deal slightly less damage (2% → 1.8%). Sonic's Final Smash has been changed. He still transforms into Super Sonic and launches foes on contact; however, his speed has been drastically increased, and he moves automatically on the horizontal axis, so only his vertical position can be controlled. When reverting from Super Sonic, Sonic deals damage and knockback if he makes contact with opponents while flying back to his starting point. Super Sonic's damage output is significantly weaker than its previous iterations, and lasts for a much shorter time period. The more limited controls also make it less possible for him to secure an early KO. Sonic has been buffed via game updates. Sonic's forward tilt connects more reliably and back aerial has less landing lag, making him less vulnerable upon landing with it should it not be autocanceled. Super Sonic has also received multiple buffs. The animation of Sonic when swinging a bat has been altered. The animation of Sonic crouching when holding a light item has been altered. Super Sonic via FS meter has a higher knockback multiplier (x0.62 → x0.71). Spin Charge no longer makes Sonic lose his double jump when performed on platforms. Super Sonic has more range. Super Sonic via the FS meter has more range and deals more knockback. Sonic takes continuous damage when swimming. He shares this with Charizard, Incineroar, and Inkling. 2% The Punch + Punch + Kick combo from Sonic the Fighters. Its first and second hit are capable of jab locking. 4% (hit 1), 7% (hit 2 feet), 5% (hit 2 legs) The Horse Kick from Sonic the Fighters. It hits twice, has minimal start-up lag, and can be angled. Altogether, these traits make it useful for spacing, starting tech-chases, or as an out of shield option. 2% (hit 1), 6% (hit 2) A 540 kick, similar to Captain Falcon's up smash. Its decent vertical range makes it a fairly useful anti-air attack, although it has poor horizontal range. It can also combo into a short hopped forward aerial at 0%-40%, and into a Spring Jump-assisted forward aerial at 80%-90%. However, the former is reliable only against heavyweights and fast-fallers; the latter is consistently reliable only against middleweights; and both are heavily reliant on DI. It resembles the Skip Kick from Sonic the Fighters. 6% A legsweep. Its diagonal angle can lead to combos at lower percents. It resembles the Leg Throw from Sonic the Fighters. 6% (early hit), 4% (late hit) A flying kick similar to Fox's. It is a reliable follow-up from a down throw. While its very minimal start-up lag can allow it to pressure unwary opponents, it is very punishable because of its considerable ending lag. 14% The Wind-Up Punch from Sonic the Fighters. It has high knockback growth, deceptive range, and can be angled, all of which make it one of Sonic's most viable KOing options. However, its very low base knockback makes it better suited for KO attempts later instead of earlier. It also has noticeable start-up and ending lag, making it risky if used unwisely. 5% (hit 1), 1% (hits 2-7), 3% (hit 8) A jumping Spin Dash. It hits multiple times, with its last hit having extremely high knockback growth. However, its last hit has average base knockback, which makes it better suited for KO attempts later instead of earlier. 12% A split kick, similar to Fox and Falco's down smashes. It has the lowest amount of start-up lag out of Sonic's smash attacks and hits on both sides, which make it useful for punishing rolls. It is also a semi-spike, which makes it very useful for edge-guarding. However, it lasts for only 1 frame, and has considerable ending lag. 12% (clean), 8% (late), 5% (latest) Curls up into a ball and spins while slightly undulating up and down. In addition to being a reliable follow-up from Spin Dash, Spin Charge, and Spring Jump-assisted combos, its launching angle makes its clean and late hitboxes into useful combo starters at low to medium percentages when SHFF'd. It resembles the Air Spin from Sonic the Fighters and the Insta-Shield, an attack that debuted in Sonic the Hedgehog 3. 0.8% (hits 1-5), 3% (hit 6) A corkscrew battering ram, similar to Pikachu's forward aerial. It is tied with up aerial for the lowest amount of start-up lag out of Sonic's aerials. When coupled with its last hit's very high knockback growth, it is useful for spacing and edge-guarding. It can also combo into itself in certain instances, thanks to Sonic's fast air speed and its fairly large auto-canceling window. It resembles the Emerald Dive from Sonic the Fighters. 14% (clean), 10% (late) A hook kick. Its clean hitbox's impressive damage output and high knockback growth make it one of Sonic's most viable KOing options, especially when used for edge-guarding. However, it has moderate start-up. 3% (hit 1), 8% (hit 2) A scissor kick. Its very large auto-cancel window makes it deceptively safe and easy to avoid even its fairly low landing lag. In addition to being a reliable follow-up from Spin Dash, Spin Charge, and Spring Jump-assisted combos, it is a viable KOing option near the upper blast line, especially as a follow-up from Spring Jump. Both hits don't always connect very reliably however. Shooting Star Kick 8% (clean), 7% (late) A diagonal flying kick. It is a stall-then-fall, but unlike the majority of other stall-then-falls, it is relatively safe to use off-stage thanks to it having noticeably less ending lag in comparison. Its clean hit also meteor smashes aerial opponents at the beginning of the attack, but not grounded opponents. It resembles the Stomp Dive from Sonic the Fighters and the Sonic Rocket from Sonic Battle. 1.3% A knee strike. A fairly fast pummel. 1% (hit 1), 6% (throw) A stretch kick. Due to its average damage output, very high base knockback, and average knockback growth, it is mainly used to force the opponent off-stage. It also has KO potential, albeit only on edges and at very high percents. It resembles the Top Kick from Sonic Battle. 7% Quickly backflips repeatedly with the opponent in tow before performing the tomoe nage (a Judo throw). It is Sonic's only throw with consistent KO potential. 1% (hit 1), 5% (hit 2) Heaves the opponent upward and sharpens his quills to stab them. It can be followed up with an up aerial and inputted Homing Attack at 0%-20%, and Spring Jump-assisted neutral, forward, back, and up aerials beginning at medium percentages. Like forward throw, it has KO potential, albeit only on with stages with highly positioned platforms, such as Battlefield's top platform. 1% (hits 1-3), 5% (throw) Pins the opponent to the ground and then Spin Dashes onto them. Due to being a semi-spike, it is reliable for tech-chasing and setting up edge-guards. It resembles the Double Spin from Sonic the Fighters. 7% Spin Dashes around in a circular motion while getting up. 7% Performs a legsweep while getting up. 5% Performs a legsweep while getting up. 9% Spin Dashes forward while climbing up. It resembles the Cliffhanger Flip from Sonic the Hedgehog Spinball. Homing Attack 7%-20% Curls up into a ball while briefly ascending, homes onto the nearest opponent, and then rams into them. Pressing the special button will execute the move earlier. Spin Dash 6%/7% (dash), 5% (initial jump), 3% (jump) Curls up into a ball, performs a short hop, and then starts rolling toward the opponent at a fast speed. Holding the special button charges it up and increases its speed. In addition to granting intangibility at the start, it boasts impressive combo potential, thanks to its ability to be followed up with any aerial attack. However, if uncharged, it stops when it hits a shield, making it very unsafe if shielded. It also boasts horizontal recovery potential when it is jump-canceled immediately upon releasing the special button; this turns the dash into a "Spin Shot", a quick, long-ranged short hop that can be performed either on the ground or in the air. Spring Jump — (jump), 4% (spring) Pulls out a spring and uses it to springboard into the air. Although it is primarily used for recovering, it is also useful for partaking in combos. It grants intangibility at the start, while the spring itself can also be used to gimp recovering opponents underneath Sonic. Spin Charge 1.8% (per hit) A Spin Dash that hits multiple times and has more momentum. It also has slightly different aesthetics, requires button mashing in order to charge. However, it lacks a short hop at the beginning, cannot be canceled in any way, and it can only become a "Spin Shot" when used in the air. Super Sonic 12% (Chaos Emeralds), 6% (each ram), 10% (detransformation) Gathers the Chaos Emeralds and uses them to attain his Super Transformation from the Sonic the Hedgehog games. When activated while very close to an opponent, the Chaos Emeralds will damage the opponent. 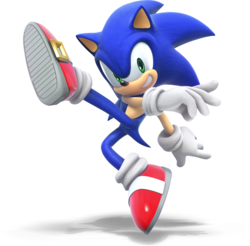 Upon being activated, Sonic is invincible during its duration, and flies around rapidly horizontally and can change his horizontal position. Sonic turning normal again also deals damage to opponents is near him. Sonic Spin Dashes onto the stage from the foreground and strikes a pose. Up taunt: Somersaults and then crosses his arms with his index finger pointing out, one of his signature poses, while making three tsking sounds. Side taunt: Performs the Super Peel Out, a technique that debuted in Sonic the Hedgehog CD, while saying "Sonic Speed!" (遅すぎだぜ！, You're too slow!). Down taunt: Performs the windmill, a breakdancing move, while saying "C'mon!" both in English and Japanese. Looks at the camera for a moment while tapping his foot impatiently. It is his idle animation from the Sonic the Hedgehog games for the Sega Genesis. Turns towards the player and waves his finger in a patronizing manner while smiling. It resembles an animation he performs after clearing an Act or defeating a boss in Sonic the Hedgehog 3. Ripped directly from Sonic the Hedgehog (2006), which itself is an orchestrated remix of the tune that plays when a character has passed an Act in Sonic the Hedgehog 3, although the ending is slightly abridged. 6WX - One of the best Sonic players in the United States. Placed 33rd at Glitch 6 and 65th at GENESIS 6. KEN - The best Sonic player in Japan. Placed 1st at Midwest Mayhem Ultimate, 3rd at Umebura SP 3 and 17th at Umebura SP. Lui$ - Placed 9th at Super Splat Bros. Ranked 1st on the NorCal Ultimate Power Rankings. PowPow - Sonic player from Wisconsin who placed 13th at Midwest Mayhem Ultimate. Sonido - Placed 49th at Frostbite 2019 and 65th at GENESIS 6. Sonix - The best Sonic player in the Dominican Republic. He is PR'd #1 in the Dominican Republic and was the highest placing Sonic at GENESIS 6 with 25th. SuperGirlKels - Placed 5th at LAN ETS 2019. Sonic's opponents are a mix between the game's fastest characters as well as references to characters in other Sonic titles. His credits song is Live & Learn. 1 Fox Green Hill Zone Green Hill Zone Fox is supposed to represent Sonic’s sidekick, Miles “Tails” Prower. 2 Captain Falcon Figure-8 Circuit Super Sonic Racing The stage, music, and opponent all reference Sonic R, a racing game. 3 Giant Metal Sonic Fourside Ω Open Your Heart The music and city setting, as well as its chronological placement, likely reference the battle against Perfect Chaos at the end of Sonic Adventure; the stage and opponent could also reference the Metal Sonic boss fight at the end of Stardust Speedway Zone in Sonic CD. 4 3 Kirbys Halberd Sonic Heroes The Kirbys represent the three character types from Sonic Heroes: Speed (Blue), Flight (Yellow), and Power (Red). The stage choice likely references Final Fortress, the final level of said game. 5 Sheik Mushroomy Kingdom Seven Rings in Hand The stage, music, and opponent all reference Sonic and the Secret Rings, which has an Arabian setting. 6 Giant Incineroar Windy Hill Zone Wonder World Incineroar represents Zavok, the leader of The Deadly Six from Sonic Lost World. Final Master Hand and Crazy Hand Final Destination Master Hand On intensity 7.0 and higher, Crazy Hand fights alongside Master Hand, and the track Master Hand / Crazy Hand plays during the battle. Note: Every stage other than the final round plays a track from the Sonic universe, no matter what universe the stage originated from. Sonic was among the fighters summoned to the cliffside to assist in defeating an army of Master Hands. During the opening cutscene, Sonic was present on the cliffside when Galeem unleashed his beams of light. While attempting to run away, Sonic noticed Pikachu doing the same and reached his hand towards Pikachu in an attempt to save it, but both he and Pikachu were vaporized and placed under Galeem's imprisonment. Sonic was one of the many fighters that fell under Dharkon's control upon Galeem's first defeat. He appears in the Sacred Land sub-area as one of the fighters that block the Master Sword, making him one of the obligatory unlocks. He is later seen standing next to Mario, as the heroes prepare their last stand against Galeem and Dharkon. Sonic's Fighter Spirit can be obtained by completing Classic Mode. It is also available periodically for purchase in the shop for 500 coins. Unlocking Sonic in World of Light allows the player to preview the first spirit below in the Spirit List under the name "???". As a Fighter Spirit, it cannot be used in Spirit Battles and is purely aesthetic. Each Fighter Spirit has an alternate version that replaces them with their artwork in Ultimate. Additionally, Sonic makes an appearance in a few Primary Spirits in other forms. Sonic artwork, as posted on the official Japanese Sega Twitter account. Sonic idling on Wrecking Crew. Attacking R.O.B. with his up tilt on Skyworld. Coming to a halt before a Shy Guy on Figure-8 Circuit. Attacking Shulk with Spin Charge on Mario Galaxy. With one of Bayonetta's butterflies on Skyworld. Running with Falco on Prism Tower. With Olimar, Pac-Man, and Mario on Gaur Plain. Sonic and Villager getting hit by Robin's down smash on Wily Castle. Sonic holding Death's Scythe on the Bridge of Eldin. Sonic and Knuckles posing on Palutena's Temple. Sonic and Knuckles posing on Garden of Hope. The logo for Sonic Team. Sonic's character icon in some Sonic spin-off games. The life icon and 1-ups in Sonic Unleashed (when Sonic is not in his Werehog form), as well as the 1-ups from Sonic Colors. It is also one of four to show the character's eyes, the others being R.O.B., Kirby, and Meta Knight. Sonic is the only third-party character in Ultimate with more than one home stage representing his series. Unlike other installments in the Super Smash Bros. series, Sonic slowly takes damage if he falls in any body of water, which is a nod to his inability to swim in his own series. While Sonic has appeared in three installments, Ultimate marks the first time Sonic is the first third-party character announced, as Snake was announced before him in Super Smash Bros. Brawl, while Mega Man was announced before him in Super Smash Bros. 4. Sonic being unlocked by clearing Classic Mode as Mario is a reference to the bitter rivalry between the two of them in the '90s through 2001, while Sega was still a console manufacturer. The games Sonic's Classic Mode references go in chronological order from each console generation starting from the 4th (Sega Genesis) to the 8th (Wii U). Sonic is the only character who travels to Figure-8 Circuit and Green Hill Zone in Classic Mode. Prior to version 2.0.0, There was a glitch that allowed Ridley to instantly KO Sonic. On 2D stages, if Ridley grabbed Sonic with his Space Pirate Rush while Sonic is recovering from a Homing Attack near the ledge, Sonic would be instantly sent into the horizontal blast line. As is the case with Smash 4, Sonic's snoring and surfacing voice clips are taken directly from Super Smash Bros. Brawl, in which he was voiced by Jason Griffith, despite otherwise being voiced by Roger Craig Smith. Sonic is the only third-party veteran to have his victory theme changed in some way, being slightly sped up and abridged at the end. 1. ^ translates to "Circle Throw"
This page was last edited on April 19, 2019, at 11:57.